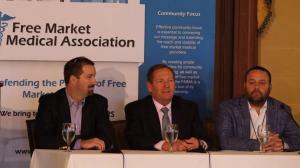 While I am an unapologetic advocate of free markets and know, truly know, that the mutually beneficial exchange of unfettered competition is the only moral and utilitarian method for humans to trade, I must admit that I was in awe watching this process unfold at our inaugural Free Market Medical Association (FMMA) conference. It was one thing to hope that the various buyers and sellers would find one another. It was quite another thing to witness the speed with which the parties found each other and also how rapidly and naturally actual solutions emerged after these introductions were made. There is an old German proverb that states, “Whose bread I eat, his song I sing.” That saying was a colorful way to explain the loyalty or service that was due a benefactor from a debtor. It encompassed everyone from traveling musicians to the serfs performing and serving at the behest of a gracious, or often a demanding, lord. In my upcoming book tentatively titled, “If You Really Want To Understand Health Care”, chapter six, Issues of Access & Insurance: 1913-1964: The AMA Fails To Lead, discusses in detail the acrimonious debate within the AMA regarding mandatory Social Insurance. It was first introduced in Germany by Chancellor Otto Von Bismarck as a counter to Marx & Engel in 1883 and then a similar plan was initiated by David Lloyd George in Great Britain in 1911. Theodore Roosevelt running for the Presidency in 1912 had mandatory health insurance as part of his , “Bull Moose” platform. The AMA by then the major voice in American Medicine, began seriously debating this issue starting in 1913. At first the AMA was supportive, but was concerned about third party control of medicine so it then grew to oppose any form of universal coverage. 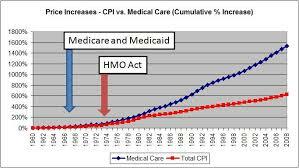 Unfortunately, the debate then as now presented two alternatives: no universal coverage or third party dominated care. The concept of patient-directed health care via premium support for all via some form of tax credit was not introduced till many decades later. This would allow universal coverage yet retain patient control of their own care. The question we face today, can we finally break away from the German model of 3rd party dominated medicine with all its problems and move to a more modern and personal style of patient-directed medicine available to all, is yet to be resolved. Figure 1: An Indexed Comparison of Health Care Inflation and Consumer Price Index in US from 1935 to 2009 (Source: US Census 2013) Nobel Prize-winning economist Milton Friedman wrote that medical price inflation since 1965 has been caused by the rising demand for health-care coupled with restricted supply (Friedman 1992). via Blog | Mises Institute.